If not detected early and treated or remove, cancers can metastasize within one to three years for those with Lynch syndrome. Metastasis is when the cancer cells may travel to distant parts of the body through blood or through the lymphatic system. As they spread, they detach from the primary tumor and they dig through the blood vessel wall to enter into the bloodstream. Again, they must exit the blood vessel wall to enter into the distant sites. 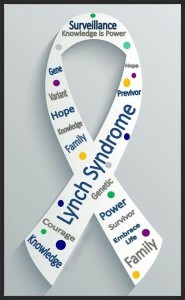 Unlike a “Previvor” who has been diagnosed with Lynch syndrome but has not sustained a cancer, the “Survivor” is an individual who has Lynch syndrome and has been diagnosed with a cancer. Dependent upon the extent of the cancer, treatment will vary. Many different treatments exist, both scientific and those involving complimentary alternative medicine. Other cancers of Lynch Syndrome include Brain Cancer and Muir Torre (a skin cancer consisting of sebaceous adenomas – gland tumors –keratoacanthomas) Breast cancer (in certain subsets) and prostate cancer have been recently added as a result of some studies.